The Isle of Wight, Hampshire, England, was visited from 17th to Thursday 19th April 2012. The target was to investigate approaches to managing coastal change, adapting to climate change and saving the coastline for future generations. The participants discussed issues of managing coastal change (e.g. risk assessments, policies & plans), of saving coastline for future generations (e.g. threats to public access and planning for the future) and of adapting to climate change (e.g. responding to sea-level rise and a changing attitude to invasive species). The Isle of Wight National Trust sites present the best that the Island has to offer of coastal and inland landscapes, historic properties, archaeology, natural and semi-natural habitats and open accessible coast and countryside. The National Trust owns nearly 10% of the total area of the Isle of Wight, including 17 miles of coastline, many areas of outstanding natural beauty and several unique historic buildings and features. The island’s geology is mostly Cretaceaous and Tertiary, creating a range and variety of landscapes and habitat. Almost all the properties lie within designated areas (Area of Outstanding Natural Beauty, Heritage Coast or Sites of Special Scientific Interest, Special Area of Conservation). Many include scheduled ancient monuments of national significance. Newtown is a National Nature Reserve, part of a Special Protection Area (SPA) and RAMSAR wetland site. The island’s geology, together with its palaeontology, is of world significance. The portfolio of buildings in the National Trust’s ownership illustrates a great deal of the island’s history, its strategic importance through the ages and its highly localised and varied building styles, these being a further reflection of the island’s geology. The most significant are Bembridge Fort, the Needles Old Battery, Newtown Old Town Hall, North Street Brighstone, St Catherine’s Oratory, Mottistone Manor and Bembridge Windmill. In terms of local goverment, the Isle of Wight has a unitary authority, the Isle of Wight Council, which fulfills an number of functions including coastal defence, planning and highways. The Isle of Wight is covered by a Shoreline Management Plan, a strategic coastal document that identifies coastal strategy. Approximately 6o% of the island is designated as an Area of Outstanding Natural Beauty (AONB). This is a landscape designation whose principal purpose is the conservation and enhancement of protected areas. 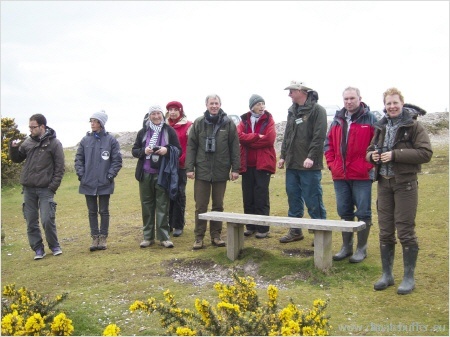 All of the areas that we shall visit in this study tour are within the Isle of Wight’s AONB. the Ventnor Downs, the most southerly chalk outcrop in Britain.